The council has almost 8,000 people on its housing waiting list, a figure which the Tories say they can improve by refinancing housing revenue. Tory leader Andrew Jarvie said he was tired of sitting in meeting after meeting hearing there was not enough money to build council houses. He said: “We went back to basics about how council houses are built and maintained, and discovered a finance process called ‘capital from current revenue’ is heavily used. “This makes up 0.1% of expenditure in the main council account, but 9% of the housing revenue spend last year. “By refinancing a small proportion of this at today’s low rates, we can, taking the most cautious approach possible, release £9.6m to build more homes and offer more improvements, such as double glazing and new heating systems, to existing tenants to lower energy bills. Mr Jarvie said the proposal would an enable 115 new council houses to be built, over and above the council’s aspiration of 300 per annum. 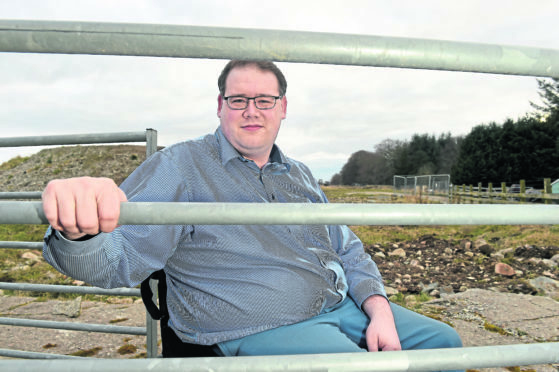 To cope with the current shortage of land for building, Mr Jarvie said the Tory proposal includes up to £50,000 for a new surveyor to identify sites and progress the sale of land to the council for housing. He said new houses would reduce demand for temporary accommodation, amounting to a saving of £150,00 against homelessness. He said: “There would also be more money for improvements to current stock and approximately £142,000 extra council tax revenue. Mr Jarvie said his group had been working with senior council officials on the proposals for the past four months and had garnered their support for a scheme which he said is radical for the Highlands. Environment, Development and Infrastructure chairman Allan Henderson said while he welcomed new ideas and new ways of working, he had reservations.